Brandon University will host the 2017 Black Canadian Studies Association Conference. BRANDON, Man. — The history, present and future of African Canadians will be explored when Brandon University (BU) hosts the 2017 Black Canadian Studies Association (BCSA) Conference. The goal of the conference, held every two years, is to promote dialogue, critical reflection and broad engagement around developments affecting the Black and other communities in Canada. The 2017 conference, entitled “Blackness, Indigeneity, Colonialism, and Confederation: 21st Century Perspectives,” will take place from May 11–14. Organizers expect 200–300 people to attend the event, with Canada’s 150th birthday forming the backdrop as the participants discuss what this milestone means to Canada’s diverse Black community in light of their achievements, challenges and contributions to the country. The BCSA Conference was last hosted by Dalhousie University in Halifax in 2015. 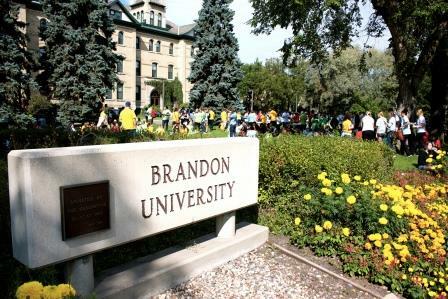 “I had the honour of being an invited speaker at the 2015 conference, and I am tremendously pleased that Brandon University will host this prestigious event for 2017,” said Dr. Gervan Fearon, BU’s President and Vice-Chancellor. “Canada is a mosaic of peoples and cultures that together make an inclusive and prosperous society. At the 2015 conference, the insight gained from the presenters was remarkable, and the discussion that grew out of their ideas helped to illuminate key elements of our society and our identity as a nation and a community. A call for papers and presentations was recently announced. A wide variety of topics are expected to be discussed, including the parallels and differences of Black and Indigenous Canadians with regard to the colonial state, Black arts and artists, and the Black farmers movement.